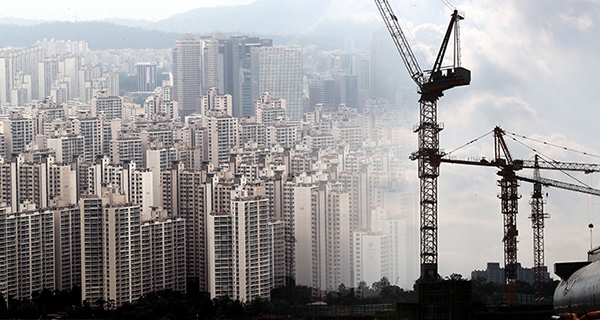 New construction orders in South Korea shrank to a 37-month low in February, adding woes to the Korean economy where construction activity had fueled otherwise feeble domestic demand over the last two years. According to the Construction Association of Korea on Tuesday, Korean builders bagged combined 8.59 trillion won ($7.53 billion) worth orders in February, shriveling 9.6 percent from the same month a year ago. The figure is the lowest since January 2016 and a four-year low for February. Orders from the public sector fell 8.4 percent to 2.83 trillion won worth amid reduced activity in power stations and other infrastructure, and those in the private sector down 10.1 percent to 5.77 trillion worth due to sluggish facility investments. Dwindling orders are a bigger headache to builders who have received a blow from the slowdown in the local housing market following a series of government actions to tame the property market through loan and licensing regulations as well as tougher taxes.